The thrill of bagging a Winter cod while fishing on hard ground has to be one of the most memorable and exhilarating feelings any shore angler will ever experience. Pumping hard on the beach rod and winding fast gets the blood going, especially if your rod is bending under the weight of a sizeable winter cod. It takes a particular type of angler to do it successfully, and while many are more than willing to lob substantial hook baits into a hidden tackle graveyard, few have the skill to beach their prize. North East and North Yorkshire anglers, along with those based along the east coast of Scotland, have perfected the art of rough ground cod fishing in Winter. Regularly putting their tackle through its paces and often during conditions that will test the mettle of any angler. It's pure determination and stamina that ultimately leads to success. Unlike South Coast Anglers who have the relative comfort of a shingle bank, shore anglers prepared to venture on to ground uncovered by the tide will soon find out that comfort is not on the agenda. Why are rough ground venues and the obstacles they bring so appealing to a cod angler? When covered by the tide, these snag-ridden areas provide cover, safety, and food. As the tide eventually slips out of sight, cod will not venture very far. Instinct tells them that in just a few hours, the tide will return. These outcrops will no doubt leave an angler exposed, and as the tide drops further, a selection of cod target areas will suddenly reveal themselves to you. It is then down to you to present your sea fishing bait offering into these inevitable snags and hopefully set a trap for an unsuspecting, hungry cod. The first rule of thumb when fishing these areas is to dismiss setting up a base camp. Erecting a brolly or beach shelter will be a total waste of time. As the tide quickly falls, you can find your positioning is far away from the water. Instead, leave your tackle box or rucksack safely at the rear of a venue and be prepared to walk to your casting point. After casting, you should be prepared to stand and hold your rod in readiness for the unmistakable pull from a cod. Many rough ground anglers will tell you that the initial bite, slack line or heavy lunge that a cod will bring is far superior to any rattle on the rod tip, and that a tripod is seldom used. 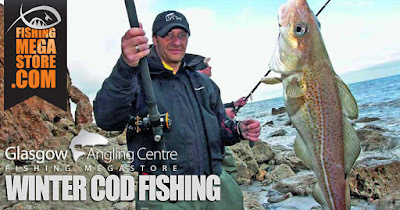 Sea fishing tackle choice, especially rod and reel, are indeed vitally important when it comes to fishing for winter cod in rough ground. A soft-tipped match rod coupled with a small palm-sized multiplier reel or fixed spool reel is useless. Instead, opt for a powerful rod with guts of around 13-14ft and a fast-retrieve reel capable of holding a large amount of 18-22lb mainline and a heavy rubbing leader. Avoiding the snags all depends on how quickly you can raise your end rig in the water when retrieving. Often your rig will become trapped, but being able to lean harder on your rod and reel can release it. 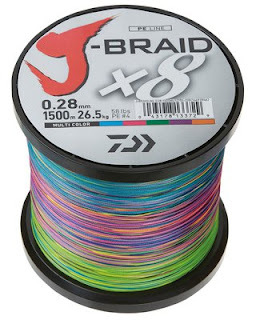 Many rough ground anglers are seeing the benefits of switching to larger fixed-spool reels loaded with braid nowadays. With braid, there is minimal stretch involved, and contact is almost instant while the amount of line retrieved on each wind increases. Sea rigs will always boil down to personal preference. Some reckon the pulley rig will forever rule over rough ground. The fact that the harder you pull, the higher the sinker will rise certainly helps to avoid snags. Other anglers prefer the standard paternoster set-up. One thing they all agree on is the fact that a rotten-bottom system is necessary. Again, the choice of best rotten-bottom system is debatable. Gemini, Breakaway and Anyfish Anywhere are good examples, while the homemade panel pin and piece of foam is a firm favourite with many. Choosing the right tide time is crucial for success when winter cod fishing. A small tide generally means that many marks do not reveal themselves on a retreating tide. In contrast, a spring tide is regarded as the best because access to water that is otherwise not available offers a greater chance of success. The only downside is that fishing time diminishes. A spring tide can see the water ebb very quickly, but the flipside of the coin will see it flood back again just as quickly. Weather plays an important part too. During rough seas, rising swells quickly swamp a cod fishing venue. 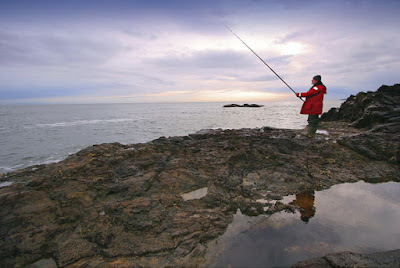 Always check the safety of a mark – in any case, rocky marks often fish better in coloured water as the sea flattens. While beach anglers prefer the cover of darkness to target a cod, rough ground rods will find success in daylight. Rocks and weed provide excellent protection and an abundance of food. Fishing in darkness isn’t so crucial. As with all fishing, bait is hugely critical. If you know what natural food sources are available in and around your chosen venue, you are already halfway along the road to successfully bagging a rough-ground winter cod. Shellfish like crabs, mussels and shrimps provide easy pickings in these surroundings, especially after a storm, and along with smaller fish, your bait choice should follow suit. One thing you should be aware of is that cod invariably feed by scent. Mounting a single lugworm on a Pennell rig certainly won’t attract much hungry cod to you. Conversely, two halves of a large peeler crab, mixed with mussels, makes a fantastic cocktail bait. By adding squid, Razorfish and Bluey, you can enhance the scent even more. Cod don’t have the nickname of ‘bucket mouth’ for nothing, so you shouldn’t be afraid to make your offering as large as you think adequate.